That ain't the baby, that's my baby! Don't let the infantile name fool you. DaBaby has talent beyond that of his namesake. Inspired by the likes of Eminem, Jay-Z, Lil Wayne, and 2Pac, DaBaby understands the importance of those who came before. Blending comedy, charisma, and technical prowess, the North Carolina rapper has solidified himself as one of the new school's most promising. Carving out his own niche without the benefit of an A-List co-sign, DaBaby has built his own foundation, with his "Billion Dollar Baby Entertainment" imprint allowing his vision to grow. 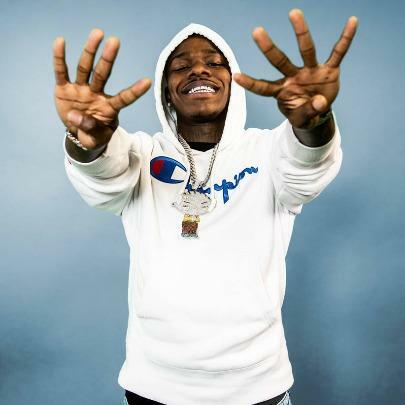 2017 found DaBaby unleashing a prolific mixtape run, including a Baby Talk pentalogy, which solidified him as one of North Carolina's rising talents. Between diaper-strolls and a nonstop barrage of music, DaBaby's presence soon became difficult to ignore. It wasn't long before the rapper was buzzing online, garnering a loyal following through his throwback, comedically-tinged visual drops. In March of 2019, DaBaby delivered his official major label debut album Baby On Baby, which featured Offset, Rich Homie Quan, Rich The Kid, and Stunna 4 Vegas. Now, having officially joined the Interscope team, DaBaby is looking to continue his ascent. His top 5 include Eminem, Jay-Z, 2Pac, Lil Wayne, and DaBaby.